Interviews are formed with layers and they have different rounds to it. The whole word interview itself sends many ruffles around. But the challenge remains to clear the main level-when they call you to get passed through the very first round. Thus, it is necessary that you face everything very well and not be in a spot. It is necessary however to understand what is a third round of the interview? 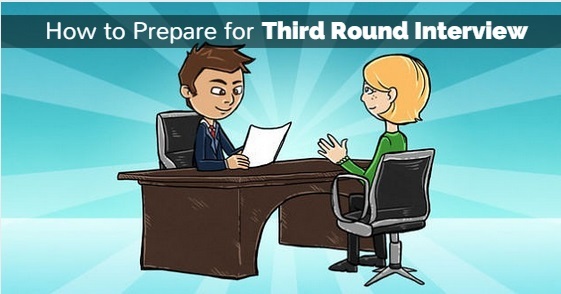 Read up on these details to find what exactly it means to clear a third round interview. A third round of interview is when you clear all the other level of interview and get through the first and the second one. Here you directly get to meet the main person-the CEO- the executive of the company. In major organizations, the first base is just clearing your resume and application level. The company must feel confident that you have the required skill set to take up any job. News about job pitching is posted and employees need to send in their resumes to be a perfect fit for the role. Second base is nothing but a kind of talk taken on the phone and a third interview is where you have to meet the person. Here it becomes necessary that you do practice whatever you need to say well in advance. Take down and also review notes which you would have made a note of from your previous and earlier interviews. Also, try and brush up on your knowledge about the required company, or even the job. Review notes from earlier interviews to make sure you have refreshed your knowledge and thoughts about the company. Make sure you know enough about the recruiter or the hiring manger who is going to give you the job. You must be able to find answers to questions which your interviewer promised to keep a track of it. This will help you to show you did pay attention to whatever was going on. It is very necessary to show your employer that you do have the knowledge which they think is needed. Thus, even without getting an update, try and speak about the knowledge or some current news or updates that could have happened. Speak much about what you know and how things shaped up. This will tell your employer that you do sincerely want to get placed in their company. You can here and there give a jibe on what has happened recently just to show how good you are. For example, if you want a job with a software company, you must be able to tell them that you have already collected more knowledge of the new software that has come up. It is better if you train yourself with points related to how will you react in business. It is better to have some knowledge instead of no knowledge at all. Research a bit and if possible some more about the interview questions which will give you an idea about the professional traits. Thus, you will face questions like-What if your colleague is not responding well or behaving the way you want him or her to behave. What if the employee is violating the code of professional conduct? This is done so that one knows how committed the person is for getting the job. Everyone present in the room knows that you have been selected because you have something in you which make you right for the job. Thus, manifest what you are truly during your interview. People out there know that you are passionate and enthusiastic about getting the job-Thus it is perfect if you can show them that at the right time. Thus put up statements like- I am all excited and geared up to take this job and I know with my faithful contribution and preparation, I will be able to give more than required and more than my ability to the job. So, what would be the chances of an incentive or performance appraisal for any person here within three years? The third round of the interview demands that you do show your employer what you know and what you are good at. There is no advantage in hiding yourself and not making you known. It is better you sit up and tell them what you like and what you are good at. This includes many things so suppose you are a journalist and all you want to do is let your senior appreciate your skills as a senior executive. All you need to do is tell them how often you write, what you feel about the world, your opinion and your strengths. All this is going to make you a better person eligible for the job. Another example could be if you are applying for the post of marketing executive-Go up there and say aloud how much you know about the tricks of marketing. You must be able to speak for yourself and your skills in such a way that the manager is ready to hire you. Attitude and arrogance in your interview can come only when you have shown your performance to the employers. They completely have no idea who you are what you are skilled at. They have not even seen you work. Thus it is better to take a bow and show them that you are not someone who is on the skies. Thus opt and choose for being humble. Even if you have been lucky to get selected in the third round, show them you can do the task skillfully. Thus, be very grounded. Show humility in your attitude. Show that you can be very jolly with others and work. This is the right attitude a boss wants to see from you. This way, your impression will be set. It is necessary to show your boss that you are a really right person for the job. Thus, show what you have been able to achieve did in the past without fail. Ask very intelligent and wise questions . Be very true to the employer while answering. Also, be very intelligent in the way you conduct yourself. Suppose if the question is tricky then make sure you put the answer in the right way. Suppose if something tricky comes then do not forget to incorporate that also. Give a twist to your answers. Be very sure that whatever you do, you do properly. Be very confident of each response that you give. If you do not know something then say it aloud that you do not know it. It is easy for the interviewer to catch it if the employee is getting too comfortable. Sometimes, an interviewer’s style should also be relaxed and casual. It is necessary that the employer will gauge you according to what you want. If you think there is something unprofessional which may hurt or upset the employer, do not say that. Do not sit there and keep on talking about the party time you had or what you liked or did not like . Instead, be very formal and wise with your words whenever you use it. Think in your head twice how you are going to do it. It will come out right if it will be done in the right way. It is better that you practice your dialogues once you give the actual interview. Your employer must be in a state to know what you exactly know. Do not let frustration and fear get you at that time. Thus, be confident that you will place your thoughts in the right way. It is required that you face no fear when you are answering the questions for this job. It is thus very necessary that you place everything, whatever you require right. Another good thing about planning your answers is that you will be able to give the right answers without facing any fear. In the third round of the interview, any goof up will not be tolerated. Thus, answer it wisely. The third round of an interview can be a cakewalk if you want to make it one. Thus be sure and be confident. The basic and final purpose of a third interview or what is also called as the final interview; it is to see if you’re a perfect fit for the job. The employer just checks that. Make sure you have studied your responses very well before giving an interview. They know the ethics, practices very well. Try hard and practice giving interview responses which will try and best show your personality. It is nothing but the amount of professionalism you would bring to the organization which will be wanted by the employer.